Success is the natural result of the laws and principles that govern the process of creation. Lasting success is never an accident. It happens for a reason and is the expected consequence of taking successful actions and thinking successful thoughts. Every achievement is always preceded by a goal. Goal setting is the main function of our mind. Making a decision triggers a subconscious process that transforms the decision into a deed. Learning the most effective way to set goals is the number one prerequisite for success in any endeavour, for any individual, team, or organisation. 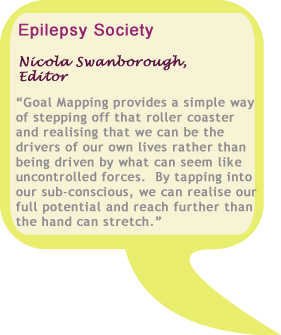 Goal Mapping is a unique whole-brain achievement system designed to help anyone command their subconscious mind to move towards consciously chosen goals, thereby maximising their potential to achieve success. It uses a combination of words and pictures to activate both left and right brain, stimulating whole brain activity. Developed by Brian Mayne, the seven steps of Goal Mapping guides you to success through consideration of the what, why, when, how and who will move you forward. It takes each person through the process of identifying their goals, defining their motives and committing to taking action. Your subconscious mind works like a helpful autopilot. Once a conscious decision or goal has been set, a sub-conscious process is triggered that begins to influence the transformation of the decision into an attitude, then an action, and ultimately through to an achievement. Where traditional goal setting techniques focus on left-brain words and endless repetition, Goal Mapping uses imagery – the language of the subconscious. It is the master skill for achievement in all areas of life. Without doubt, it is the most powerful life empowerment programme for individual or corporate achievement. Learn to focus your mind, harness your motivation, and stay committed to your vision through purposeful action. Maximise on the potential of employees at all levels in order to achieve, change and grow. Nurture existing individual skills and talents, as well as develop skills for empowerment, effectiveness and success. Become value centred and principle led in order to achieve the organisational vision in an optimal manner. Download GoalMind’s Creating Success Workshop outline. Contact GoalMind to book a a Creating Success workshop.